Fire alarms are an integral component of both commercial and residential properties. Whether you’re just a typical homeowner or the owner of a large business in the city, securing your property needs to be a priority. However, while keeping those with malicious intent out, you also need to have a plan (and the right equipment) to keep your family or coworkers safe from an unexpected danger that can start from the inside; Fire. Fire Alarm devices will help you take control of a potentially serious fire on your property before it gets out of hand. The assistance of a reliable alarm system can be invaluable and could literally be the difference between life or death. EMS Systems, Inc. is Rochester, New York’s premier security system and fire alarm experts. 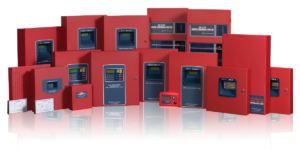 We specialize in many different types of Fire Alarm systems and have the knowledge and experience to fit you with the perfect system. We're equipped with an extensive selection of fire alarms from some of the industries most acclaimed brands like Honeywell, System Sensor, Potter, Silent Knight, Fire-Lite, Gentex, Kiddie and more. If you want to keep your household or business safe from the dangerous possibility of fires, you can be sure that a fire alarm system from EMS is using only the best products available. If you want to take your commercial or residential fire safety to the next level, there aren't many things that can beat a comprehensive security system complete with dedicated fire components. A reliable and integrated fire alarm is the first step to your fire safety needs. Fire alarms can provide you with an array of amazing benefits, but most important is early detection. The latest model detectors can identify even the most minuscule of fluctuations in harmful gases or smoke, providing you with those critical extra seconds to get everyone to safety. Fire Alarms can be as simple as a few combination smoke detectors, like what you’d expect in a small house… all the way up to a full skyscraper with integrated floor-zoned control panels, hundreds of dedicated detectors, audible alarms, horn/strobes and pull stations, all connected to a building wide fire suppression system. Whatever the size or scope of your project, EMS Systems, Inc. can design and install to meet your requirements. If you want to keep your property safe and comfortable, a comprehensive security system is essential and a fire alarm system is also critical component. EMS Systems, Inc. is a reputable, Rochester, NY based company that takes security and safety very seriously. That's why we offer residential and commercial customers many diverse options in both security products and ongoing services. Call EMS Systems, Inc. today to learn more about our first-rate choices in security and fire alarm systems.